When you consider the more popular bands in the United Kingdom’s DIY punk scene in recent years, there aren’t many people that wouldn’t consider Wonk Unit in the elite of this niche group. Headliner calibre to the likes of Pie Race Festival, Manchester Punk Festival and now this year’s Wotsit Called Fest, as well as favourites at Boomtown in recent years, Wonk Unit is undoubtedly a favourite in this scene. Pushing those DIY ethics further, Wonk Unit have unveiled their sixth album, “Terror” under Alex Johnson’s own label, Plasterer Records. Following on from where “Mr Splashy” left off, Wonk Unit continue their usual trait of writing whimsical songs with unconventional song topics, with “Day Job Wanker”, which is Wonk Unit calling out those who pick on people that don’t have “real jobs” and treading on their dreams, and “Christmas In A Crack House” which the title just tells you the whole story. This is just a taster of Alex Johnson’s trademark brand of wide-eyed indignation, contempt, and brutal honesty – mixed-up with a strong dose of black humour. The topics come with highs and lows, from trying to start a family (“Hope”), insomnia (“As The Rest Of The World Sleeps”), prescription drug addiction from injury (“Ride It Out”) and love (“Safe Place”). Musically, Wonk Unit flaunts various styles, Opener, “Day Job Wanker” is a chirpy punk anthem with crunchy riffs and hard-hitting drums balanced out by a catchy vibe sing-along chorus. However, “Christmas In A Crack House” is very sombre affair with downbeat melodies, matching the dour topic in play, it’s like a more serious version of “Horses”. “Me and Curtis” is the same song punked up, containing fast distorted riffs and up-tempo- beats. It’s a lot punchier and pure pit starter that closes the album with a bang. “Thank You" comes in as a surprise, it's a full-on reggae hit with lots of dub upstroke rhythms and relaxed atmosphere which pays tributes to The Skints, who get a mention. Johnson admits this is a rather melancholy record overall and I’ll have to agree, at least for the first half of the album. I’d suggest Side A if you’re going in vinyl terms is quite a sluggish portion of an album from a band that is recognised for fun, silly and up-tempo songs like “Go Easy” and “Je M’appelle Alex”. Take “Flummoxed More Than Jealous” for example, the song gets heavier as it progresses, but it kind of just plods along with a steady pace. The back half picks up the oomph, “As The Rest Of The World Sleeps”, “Faith” and “Judas Betrayers” all carrying some punch, gritty riffs and some real panache like “Me and Curtis”. 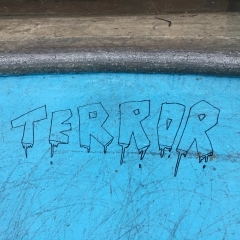 “Terror” feels like a grower, purely because of the slower start to the album. Songs like “Christmas In A Crack House” and “Flummoxed More Than Jealous”, are enjoyable, captivating on topical values, hooking you into the life story of Alex Johnson, however, It’s the more vibrant songs that really hook you in. 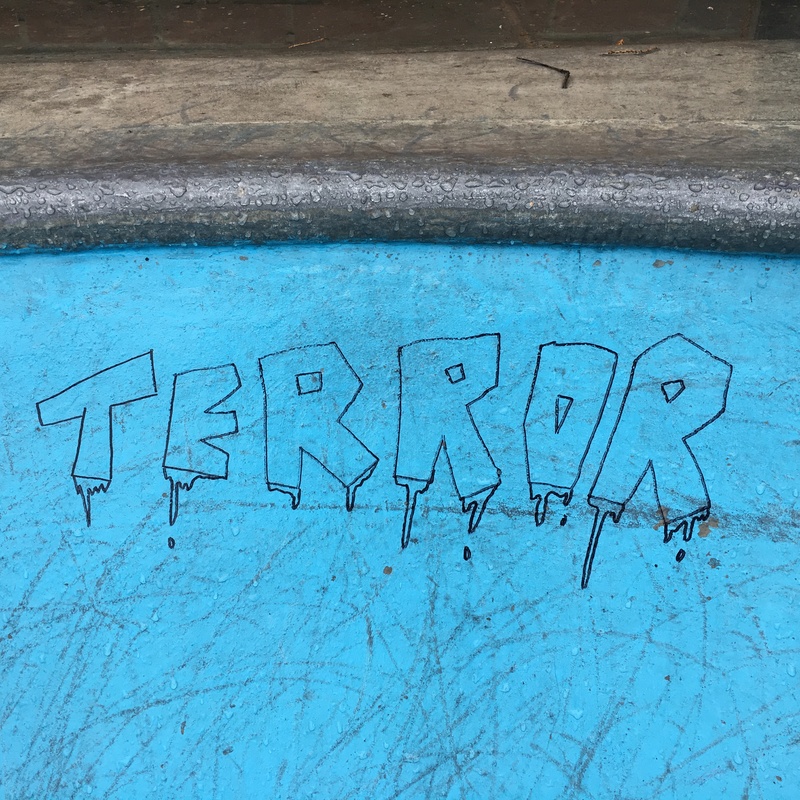 “Terror” is a rollercoaster of styles and emotions from Wonk Unit, more experimental and once again a pleasant listen from the DIY kings.